Astronauts can lose 2 percent of their bone mass each month, and experiments on the International Space Station are testing a method for countering bone loss in orbit — and back on Earth. A	A	new experiment on the International Space Station is testing an innovative “bone glue” that might help reverse osteoporosis, the crippling bone disease that affects over 200 million people worldwide. Additionally, the glue — called Tetranite — could be used to repair bone loss in astronauts on long-duration spaceflights. A SpaceX Dragon capsule launched from Cape Canaveral on Dec. 15 delivered the experiment to the ISS. 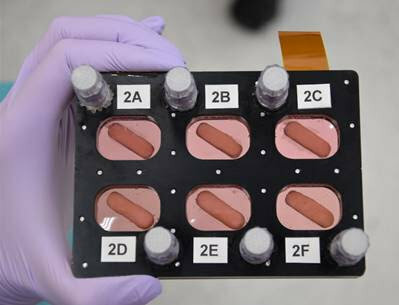 Astronauts have now been working with cell culture tests for the Tetranite experiment in the space station’s Microgravity Science Glovebox, which provides a sealed environment and built in gloves for conducting science and technology experiments. At the conclusion of the 20-day tests in space, the experiment will be frozen and sent back to Earth in January when the Dragon is scheduled to depart the station with more than 3,600 pounds of research, hardware, and crew supplies. NASA has long been studying the progressive loss of bone mass since it is a known serious side-effect of extended spaceflight. 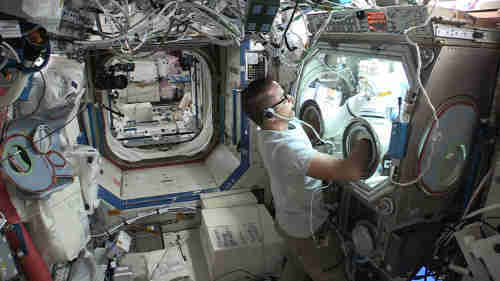 On Earth, NASA has done bedrest studies where subjects stay in bed for 90 days, simulating the effects of microgravity where the absence of Earth's gravity disrupts the process of bone maintenance in its major function of supporting body weight. Normal bones are constantly regenerating, with bone cells called osteoclasts breaking down bone and other cells called osteoblasts creating new bone. Osteoclasts and osteoblasts usually coordinate well over a person’s lifetime for good bone health. Previous studies have shown that the absence of gravitational forces causes both an increase in bone resorption by osteoclasts and a decrease in osteoblast cellular integrity. This is also what happens with osteoporosis. And since osteoporosis affects so many people on Earth, researchers hope that solving the riddle of bone loss in space will reveal important clues about what causes osteoporosis and other bone disorders here on Earth. Hess said space is the perfect environment to study key findings in how Tetranite works with patients who have osteoporosis, since it provides conditions that aren’t available on Earth. The experiment focuses on how osteoblasts grow in microgravity in the cell cultures in the presence of Tetranite and without the material. It will also test commercially available bone graft material. A duplicate of the experiment is being conducted on Earth. If the results are promising, Hess hopes to do longer tests on the ISS using the space station’s rodent research facility. He said that his company has successfully used Tetranite in rodent tests on Earth to stabilize dental implants and other tests on cow bones to determine the strength of the bond Tetranite provides. “We currently are doing testing on animals, and our next major milestone would be to get into human clinical trials for study, which we hope to be able to do in the next year or so,” Hess said. In addition to bone fracture repair, the company sees a potential for multiple orthopedic uses such as spinal fusion and dental repair. Hess said he was inspired to create a bone glue when he worked with orthopedic surgeons as part of his previous job as an engineer of medical devices. Hess said surgeons have been looking for a glue that was injectable, that worked in liquids, and was biocompatible — three problems that have been difficult to solve. Hess said the compound’s simple chemistry — small molecules from animal derived proteins — means a body doesn’t reject it. But because it’s synthetic, it can be scaled up at low cost. Hess named his company Launchpad Medical not because he thought he’d be doing experiments in space one day, but because he wanted to help people “launch” new medical innovations. But still, the chance for his company to conduct experiments in space provides a unique opportunity. WATCH: How Does Bone Marrow Actually Grow?